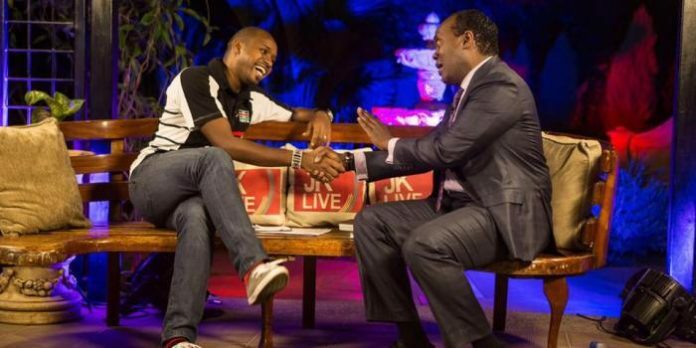 Human Rights Activist Boniface Mwangi has accused celebrated journalist Jeff Koinange of lying to him and going against an agreement they had reached. Koinange had invited Mwangi on his Jeff Koinange Live (JKL) show to discuss the State of Corruption and the recent scandals that have hit the Jubilee administration including the latest one on the Ministry of Health. The discussion was going on smoothly until the 17th minute when Gatundu South Member of Parliament (MP) Moses Kuria walked into the set unannounced. Upon Kuria’s arrival, Mwangi stood from the bench and told Koinange that it was time for him to walk out since they had agreed he would be hosted alone. “And this is the time for me to walk out. You invited me to have a discussion and am done. You invited me and told me to come alone… No, you can’t lie,” Mwangi told Koinange as he daring walked out. Kuria and Koinange tried to plead with the human rights activist to sit down and have the discussion but their words fell on deaf ears. “No you can’t walk out. Boniface, you can’t walk out. We can’t have one side of discussion Boniface. I didn’t know he was coming,” the JKL show host pleaded. Mwangi, who was still standing, volunteered to give Kuria his microphone stating that he could not have any discussion with a man accused of hate Speech. On the other hand, Koinange explained that it was an opportunity to discuss the issue but Mwangi had already left. After leaving, Kuria claimed that he saw the two on TV and decided to pass by for five minutes since they were good friends but was surprised by Mwangi’s actions. Mwangi later took to his Facebook page to explain what had unfolded: “When Jeff Koinange invited me to his show l asked, “who am l going to be with?” He told me Dennis Itumbi and l declined the invite. l didn’t want to waste my time with a spin doctor who is very allergic to the truth. After a short while, Jeff got in touch and told me he will host me alone. “KTN produced a poster for the show that circulated online of Jeff and I. Jeff tweeted several times about the show and there was no mention of another person. The show started well and we had barely warmed the bench when Jeff pulled a fast one on me. Moses Kuria, someone with several hate speech court cases, walked in,” Mwangi divulged. Nonetheless, after about twenty minutes into the show, Director of Digital Communications at State House, Dennis Itumbi also walked in. Itumbi criticised Mwangi for walking out yet he had been on the forefront in the fight against corruption, adding that he was surprised to see, “team courage become team coward”. The show went on with the three discussing the recent Health Scandal and whether it was factual or just a story fabricated by the media.